Superwater.com offers Discounted shipping at 65.00 for Freight and Insurance added Post Sale on ALL WATERBOX Global Water Inc. 4 Stage 50 GPD Reverse Osmosis System # WATER BOX orders. 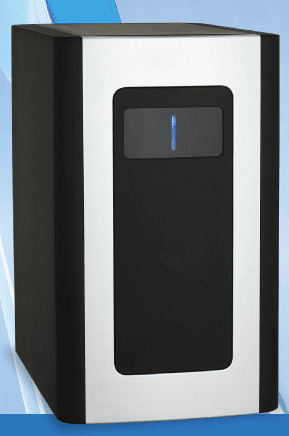 WATERBOX is new for 2013, and was designed to deliver the highest purity water for the lowest possible price. The WATER BOX fits underneath any kitchen or break room sink, and installs in just minutes. The system can be equipped with a 4 stage Reverse Osmosis purification system that can produce up to 50 gallons of pure fresh drinking water per day. The WATER-BOX also has a 2.3 gallon, stainless steel containment tank built right inside. It comes with a designer lead-free faucet that is sure to be a welcome addition to any decor. It has additional features such as a blue LED light that lets you know when it is time to change the filters. A back wash system that recirculates purified water throughout the system, ensuring that filters continue to operate at peak performance, and quick change cartridges that make filter changes simple.